While I’m procrastinating getting ready, I thought I’d post about another of my heroes. 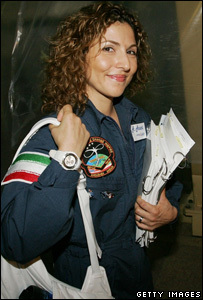 Anouseh Ansari is one of the few women to fly to space, and certainly the only Iranian woman. The most fabulous thing? She did it just after her fortieth birthday. You have no excuses not to be your best at any time in your life. Yes ladies, you can have a degree in electrical engineering, computer science, and be awarded many times over for your entrepreneurial skills and still be taken seriously wearing a full face of slap. You can also still be a woman whilst flying into space. And let’s face it, Anousheh had everything stacked against her – Iranian woman (although many Iranian women are highly educated), going into space, to a U.S. space station? We have no excuses not to pursue those lofty goals and we cannot continue unquestioningly and let ourselves be governed by the forces of the media and public opinion (who in this country at least, would have snipped the very tall poppy Anousheh is down), only to turn around in our 50s and be bitter because our lives were 100% our decision all along. My career change is sending me north, and since finishing last rotations exams (all passed), I have been catching up with people and getting ready for the next 8 weeks (which will be spent in a tumble-weed town with plenty of time to post). Coming soon…road trip via the Hunter Valley, Big Banana, and Byron Bay! I’m not able to post much due to end of rotation exams, but I was watching Glee tonight (instead of studying) and was inspired by an outfit I saw in the Madonna episode. The weather has just turned here, it’s freezing, and the masses of dark clothing in the shops has me feeling a bit down. This outfit cheers me right up and I shall be putting together my own version as soon as I am free of exams!